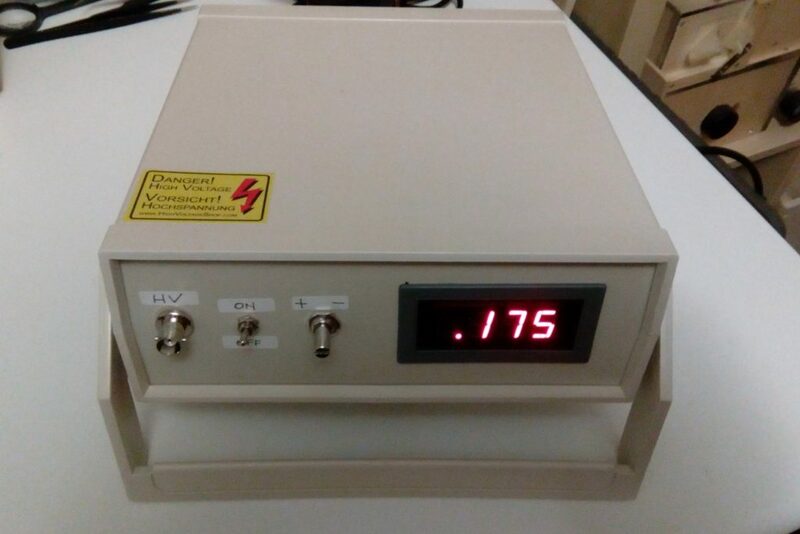 A low-noise medium-high voltage generator is always of great use in the laboratory : it is used for the powering of photomultiplier tubes, geiger counters, ionization chambers, solid state sensors for radiation, etc …. 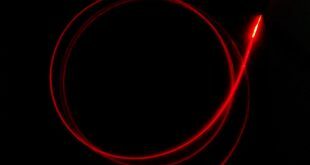 However the construction of a component of this type is not simple. An example of a DIY project is that of the PMT Adapter Theremino: PMT Adapter, an excellent project that we have used many times for gamma spectrometry, but this equipment is not able to supply “high” currents and has limitations in the range of supply voltages. 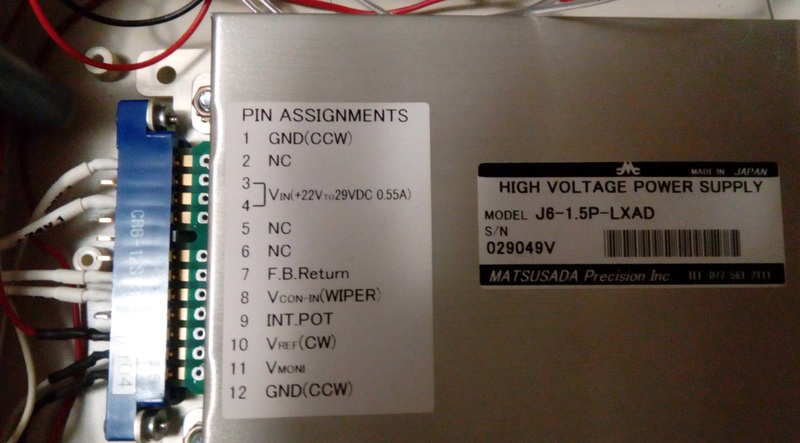 For this reason we have acquired (finding it on eBay of course) a Matsusada module capable of delivering an adjustable voltage from 0 to 1500 V with low noise (<5 mVpp). The module is equipped with a connector with 12 tracks, there are also pads for welding connecting wires. The diagram below describes the function of the contacts on the connector. 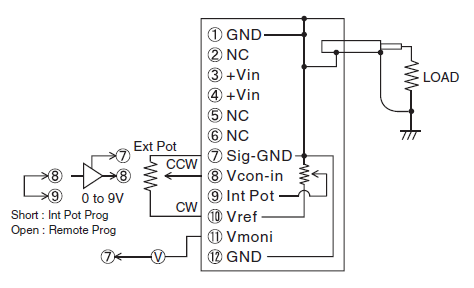 In particular, we highlight the connections for the 5KΩ potentiometer for the regulation of the HV voltage and the output for HV monitoring (1mV = 1V). In the image below you can see the detail of the Matsusada module connector. 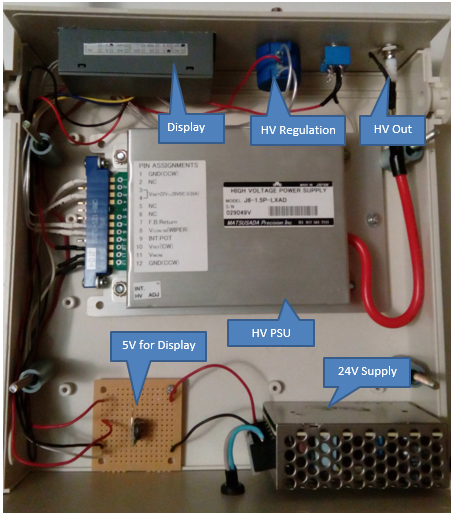 The image below shows the equipment finished and adjusted to provide a voltage of 175 V. The advantage of this equipment is the possibility to deliver even relatively low voltages (100 – 500 V) suitable for driving solid state sensors such as SiPM, APD, CZT detectors.